[Update, June 6: As background for those who are becoming aware of the UAH annual cycle for the first time, here is a chart of global monthly temperature trends in the two satellite-based lower troposphere series (UAH, RSS) and the three surface series (NASA-GISS, HadCRU and NOAA). Such a strong annual cycle is simply not credible, and casts serious doubts on the validity of this temperature series. For more on the UAH annual cycle see my previous posts on the topic (part 1 here and part 2 here). Although on the sceptical side of the AGW issue, I am uneasy about the apparent cyclical pattern in the UAH anomalies. Firstly, though, let’s be clear about what we’re seeing. Like all data sets, UAH publishes anomalies, i.e. monthly temperature readings which are relative to the mean of the corresponding months in a given base period (1979-1998 for UAH and RSS), so, for exanple, the May anomaly is relative to the 1979-98 May mean. One possible reason for the observed pattern, then, is that some of the May readings in the 1979-98 period were ‘too warm’ (rather than current readings are too cold). To support this ‘hypothesis’, I calculated the post-1992 trends for both RSS and UAH and found they were virtually identical (though significantly influenced by Pinatubo) whereas there is a small difference in the 1979-2008 trends. Another possibility relates to ENSO. The 2002-2007 period was dominated by El Nino-type conditions and it is in this period the pattern is most pronounced. [DC: The problem with that hypothesis is that there should then also be a corresponding opposite annual cycle early in the series (albeit somewhat dampened by its overlap with the baseline). UAH is the only data series to have widely divergent monthly trends. This divergence is apparent even in the tropics. And, of course, the UAH overall trends are below those of RSS and the surface temperature trends. Also note that Spencer’s explanation for cyclic divergence (diurnal drift/orbital decay) between RSS and UAH simply does not hold up, as the UAH move to the stable-orbit AQUA satellite actually increased the annual cycle and divergence with RSS slightly. (For elaboration on all these points, see my other two posts on the subject as noted above). Actually I’m just bouncing ideas around and have no idea where the real problem lies or even if there is a problem. Anyway I’ll see if I can pick up anything from your other links, but do you know if anyone has separated out the UAH monthly trends. Perhaps the annual cycle is due, in part, to the possibility that the shape of the annual cycle during the base period is changing. In other words, the seasons are changing in length. The temperatures seem to be above the 20 year mean most of the time. The shape of the annual cycle does seem to be changing, with slower cooldown in the fall and winter, and somewhat delayed warming in the late spring compared to the longer term average. I am not sophisticated enough mathematically to describe the change, but the shape of the annual cycle does appear to be changing. [DC: I’ve corrected the URL, which did not work as copied. Note that you need to select ch 05 in the channel box (not the default ch04), as well as checking off the desired years. It does seem to show a recent increase in the annual signal of UAH to about 0.2K pp. But it’s also worth noting that GISTEMP seems to have a consistent 0.1K pp signal too! [DC: I’ve also noticed an apparent moderate annual cycle in other data sets. Judging from the trends, there is a different phase peak in the surface data sets than in the satellite data sets (see second graph in the post). But, yes, GISS is more pronounced in the late year (October-November). A true “apples-to-apples” comparison of the cycle itself, though, should use the same baseline period (1979-1998). Global warming should proceed faster (northern hemisphere) winter than summer even when averaged over the globe, so a moderately growing annual cycle is not unexpected. And a later baseline might dampen the annual cycle in the surface sets somewhat. I haven’t gotten around to that yet, and it doesn’t appear at first glance that your system allows for that (or at least not in the URL you gave me). That won’t affect the trend calcs, though. More thoughts at http://wattsupwiththat.com/2009/07/16/ncdc-june-2009-second-warmest-on-record-globally/#comment-160581 rather than duplicating everything here! Thinking about this some more… You replied to John Finn that “…the problem with that hypothesis is that there should then also be a corresponding opposite annual cycle early in the series (albeit somewhat dampened by its overlap with the baseline”. Surely by definition there should not be any annual cycle in the baseline period, which is actually the first two decades of the data (1979-1998 for UAH)? 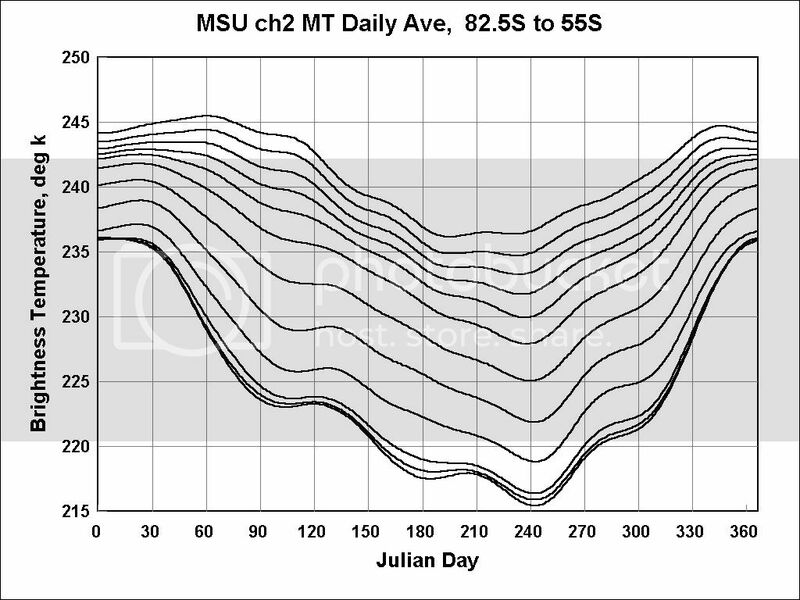 Which, BTW, makes me suspicious of the apparent baseline signal in the Fourier plots for that period above). As both John and Chad point out above, a change of shape/phase of the annual cycle in the last decade compared to the first two (the baseline period) would show as a small annual cycle. If this were real, I guess we’d expect to see it in RSS as well, so maybe it is some instrumentation/adjustment issue in UAH – I don’t know nearly enough about the technology to even guess! Anthony Watts indicated (after some childish insinuating jabs at the blogger here) that Christy has a response in the UAH readme. I find the first paragraph here to be a bit dodgy – attempting to downplay the very large discrepancy by mentioning natural factors that can affect individual years. In the 2nd paragraph, “…used to date” seems to be a subtle caveat, after admitting the range “looks too large”. Perhaps others can help them find the problem and find a suitable correction. It seems any signficant adjustment upward to the monthly values in question that put them remotely more closely aligned with RSS and the surface record would result in a fairly significant increase in per decade trend, more than Christy implies. [DC: Christy obviously expects that the end result will be to flatten the annual cycle, but leave the yearly average anomalies, and therefore trends, largely unchanged. What is certain, though, is that some of the anomalies will have to change considerably, and this is likely to be the largest retroactive change in the data set since the adjustments of 2005. By the way, I’ve responded at WUWT, partly to respond to Watts’ comments, and partly to clear up a possible misunderstanding. The cycle in recent anomalies *results* in the diverging seasonal trends discussed by Christy. But the trends themselves were not shown, leading to some understandable confusion. Not sure I want to spend too much time there, though. Some of the regulars seem mighty upset with me after reading my About and Comment Policy pages. So basically, he expects the trend for “winter” months to decrease and the trend for “summer” months to increase such that it’s mostly balanced out. While removing the divergence, this would still end up putting the trend for most months considerably less than RSS and the surface products, rather than some months in line and some months way off. Have you discussed anything with Mears and/or Wentz on this issue? They’ve been involved in finding and correcting errors in satellite data in the past. As you say, it would still be a large retroactive correction to past global temperature data. No doubt this will be done “quietly”, like every other UAH correction, as opposed to if GISS made such a correction. The mainstream media would pick up on it and a certain crowd would be claiming it’s proof of a conspiracy and we can’t trust climate science. I noticed that. The 2nd graph is much more revealing of the problem. On top of that, Watts appears not have even linked this post, as if it’s assumed that everyone’s already read it. What he did do is link the UAH readme, which contains the full list of nearly annual large corrections to the per decade trend, nearly all in the upward direction. [DC: To be fair to John Christy, he did not have to acknowledge in a very public manner that he recognizes the annual cycle is a valid issue. But he did. So that’s certainly not as “quiet” as it might have been. Anyway, further developments will be interesting, to say the least. PaulK You have yet to respond to your erroneous accusation of censorship on WUWT. Your post is there and you boo booed by jumping to a conclusion. An apology for that wrong conclusion would be in order. I’ve sent you an email, but have no response as of yet. I’ve tested a number of alternate processing methods (basically versions of not removing the annual cycle in the difference time series from the first AMSU onward) and the range from the highest to lowest is reduced to just under 0.09 C/decade. This in effect establishes a new annual cycle for the AMSUs based on the first AMSU. So at least part of the annual cycle results from intersatellite calibration from the older MSU to newer AMSU satellites. This jibes with previous observations that the annual cycle starts after 1998. By definition, Christy’s proposed adjustment will not affect overall trends. But it only removes a part of the annual cycle. I’ve played around with the UAH anomalies a bit in order to better illustrate the problem. I have taken 5-year averages of redefined “seasons” in order to reduce the noise level while still leaving enough data points to discern the time evolution. I shifted the “seasons” by one month as Feb/Mar/Apr, May/Jun/Jul, Aug/Sep/Oct and Nov/Dec/Jan, because the impact of Christy’s adjustment is largest in MJJ. The 5-year periods are indicated in the plot. Conveniently 1998 (the year both of the transition between data sets and the big El Nino) lies at the border between two 5-year periods. Thanks to MarkB, I just learned of your comments regarding the UAH TLT annual cycle. You might be interested in a report I wrote, which was published in the GRL. Swanson, R. E., Evidence of possible sea-ice influence on Microwave Sounding Unit tropospheric temperature trends in polar regions, Geophys. Res. Lett., 30(20), 2040, doi:10.1029/2003GL017938, 2003. As I recall, you highlighted possible errors, related to differing surface emissivities, that may have been introduced by the UAH LT extraction method. This makes intuitive sense to me. I take it you’re also aware of John Christy’s comments, published in the UAH readme noted by MarkB above. I suppose this blog is not an apt venue for scientific exchange, but I must admit I’m curious as to your current thinking on these issues. Perhaps you are considering publishing on this in the near future; at least I, for one, hope so. By the way, I ran across your study when I recently did a Google Scholar search on the annual cycle in UAH. Yours is the only reference I could find in the literature to a possible spurious annual cycle in the UAH data set (albeit limited to a particular zone in this case). Not only that, but you published well before the Atmoz and Tamino posts on this subject, so you deserve credit for being the first to look at this. I was planning to highlight that accomplishment in my next post on this subject, but I’m happy to do so now. Thanks for the mention. About all the recognition I’ve gotten so far is two sentences in the IPCC WG I pointing to the paper. I’ve not done much beyond producing the graphic of the TMT linked to above. I’m not a professional in the field, being from an engineering background. My knowledge of the math behind the MSU analysis does not include the theoretical foundation of the particular atmospheric emission/absorption physics, so there’s not much I can add. Or, split the data into MSU and AMSU sections, to see whether the annual cycle appears different for those two instruments. Christy and Spencer use a different algorithm for each type of instrument in order to produce their TLT time series. It could be that the AMSU algorithm has a problem. First of all, I am intending to get in touch soon (and note that I always use my real name in private correspondence). But this is a sideline for me, and I’m not well placed to do a complete analysis from scratch (not to mention also not having the time). This present post was more of a quick update and my previous post was more extensive. There, I examined the strong UAH seasonal divergence in the tropics, which certainly appears unrealistic. I also compared AQUA-based UAH to the previous data set based on NOAA-15. Also I found evidence of a less severe annual cycle in TMT/T2 in both UAH and RSS, which accords with your observation above. Clearly the UAH LT annual cycle is highly problematic, but I’m not convinced that RSS is problem-free, and there may be inherent difficulties in inter-satellite calibration that will never be satisfactorially resolved. I trust that you received my “proposal” via e-mail. I see from your previous comments that you have done some calculations similar to those which I suggested. Great! Christy, J.R., R.W. Spencer, W.B. Norris, W.D. Braswell and D.E. Parker, 2003: Error estimates of Version 5.0 of MSU/ MSU bulk atmospheric temperatures. Journal of Atmospheric and Oceanic Technology 20, 613-629. By total coincidence, version 5.3 debuts for the month of February. The official data hasn’t been updated yet (still 5.2 up to January 2010). Maybe on Monday?